Can you tell us a little about the kind of work you do? I have been working with raw food, writing and speaking on Indian raw vegan recipes and high raw lifestyle. I am also an author and a motivational speaker. I founded the Indian Raw Vegan Foundation which offers lifestyle programmes to empower people so they can be nourished in body, mind and spirit. Have you studied any discipline or did this passion evolve organically? When did you first experiment with it? More than a decade ago, I visited the Institute of Spiritual Sciences in New Delhi where I learnt and practised various forms of energy healing and meditations. This opened my eyes to the many possibilities in life. It was new and beautiful to me. Thereafter, I pursued holistic healthcare, wellbeing and education from national and international mentors and institutions. Nutrition was one of the subjects I studied. Around that time, I was sincerely seeking answers and, ever since this pursuit became a way of life for me and my family. Raw food and vegan diet have gained tremendous attention over the years. Can you simplify this concept for us? Raw food is plant food in its fresh and ripe state. Fruits, vegetables, greens, sprouts, fresh nuts and seeds are raw food. Sun-dried food or food heated below 47 degree celsius are also considered raw. The nutritious value of raw food remains intact in its whole state. This makes it very beneficial. It is recommended that every person (irrespective of their lifestyle) should have 5-8 servings of fresh raw food every day. Vegan is a term given to food that is completely plant based. It excludes all products originating from animals including milk and honey. Other than the physical benefits, tell us about the philosophy behind it? Thousands of Indians lead a raw food lifestyle. This is because there is more to it than the physical benefits like inner health, beauty and strength. Raw veganism is an ancient and natural lifestyle. It is the heritage of Indian saints, sages and tribes along with many indigenous cultures around the world. It is the only lifestyle which naturally and effortlessly nourishes your body, mind and overall being. It is known to help protect you from many dreaded and unknown diseases. In India, it has helped people overcome cancer, leprosy, auto-immune diseases and many more. It also helps beat substance addiction. True dedication towards balanced growth is the key to making any transformation. In the long run, the growth will finally be evident in all spheres of life. Being a raw vegan yourself, would you say the transformation was easy for you? What does it take spiritually to undergo such change? My son and I have lived raw food lifestyle for over four years now. It has been a beautiful and soul-fulfilling journey. We have taken outer restrictions in our stride as opportunities to learn and share more during this transformation. After undergoing several transformations step-by-step, I have observed that change is in our way of life. We can make our transformation an easy and joyful experience. Every step my son and I have taken towards this transformation has made us spiritually clear. What raw food has taught me, spiritually, is to respect everyone irrespective of what they eat or how they live and to see myself and them as who they are, instead of what they do under the influence of outer conditioning. What is the attitude to have to take up this transformative approach? True dedication towards balanced growth is the key to making any transformation. In the long run, the growth will finally be evident in all spheres of life. Every transformation takes its own time but it’s worth it. We, as a family, have come to realise that it is important to understand how to deeply listen to and understand the true guidance which is coming from within you during the phase of each transformation. Ultimately, practice makes a man perfect. Would you recommend raw vegan diet to everyone? Yes, at least a short-term detox. We know the benefits of raw vegan detox. However, it is important to learn about it from an experienced practitioner. It is also important to learn about age-appropriate and nutritional needs. Are spirituality and food habits related? In my opinion, when we progress spiritually, it leads to a deep inner connect. This connect leads us away from unhealthy food habits, discouraging you from eating due to earlier conditioning or addictions. Instead, you are able to make wiser lifestyle choices. These choices are well-balanced to accommodate your social and spiritual life, and your love for the environment. Would you say inculcating raw food habits and vegan diet can change one’s overall being and happiness? Of course. Making wise lifestyle choices definitely supports the quest for overall wellbeing and happiness. Fresh raw food contains naturally available water in its most digestible and absorbable state. Both human body and the earth are 70% water. When we consume fresh fruits, vegetables and greens we take in this bio-available water. The consumption of such water helps us become one with nature. This brings about a feeling of restfulness and peace within us making us content and well. 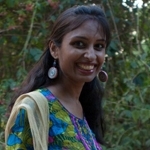 Anjali Sanghi is the president and founder trustee of Indian Raw Vegan Foundation. She is also an author who has actively been writing on Indian raw vegan recipes and lifestyle. Integrating her experience and intuition, Anjali helps people connect with their wellbeing, power and peace. She has studied holistic healthcare and wellness, and nutrition.